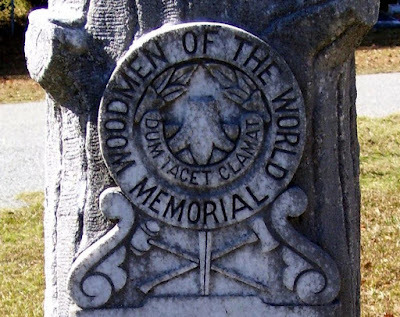 I've photographed many Woodmen of the World memorials, and I think this is the best image I've captured of their slogan, Dum Tacet Clamat. It translates to "though silent, he speaks." To learn more, visit "Woodmen of the World Memorials" on the Southern Graves website. Note: The photo is of the treestone placed for Jesse H. Short (25 Sept 1878 - 25 Apr 1943) at the Waverly Hall Cemetery in Harris County, Georgia. Kate and I found two or three Woodmen of the World grave markers in an old cemetery in Oregon City, OR. The "dum tacet clamat" phrase was badly weathered and only partially readable, but the markers are impressive: 5-foot tall "stumps". I've seen them ranging from small to tall. The tall ones are indeed impressive. If you are interested in photographing Woodmen of the World markers, I suggest you post them in the Woodmen of the World category at waymarking.com. There are currently 2,466 listed there and it is the groups goal for find and document ALL Woodmen of the World makers and related structures. Found the woodman of the world on a gravestone in Malvern, AR !